Mary Kelly’s new book Why Leaders Fail is now available! We’re excited to announce that Mary Kelly’s new book Why Leaders Fail is now available! Why do so many leaders fail, and what do the best do differently? Thousands of leadership books tell you how to be a great leader. Far fewer books delve deeper into the surprisingly common mistakes managers, CEOs, and supervisors unknowingly make that derail their success. 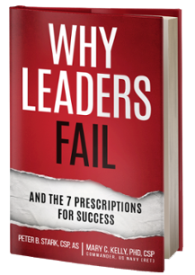 Using real scenarios and examples collected through their combined years of leadership and management expertise, Mary Kelly and Peter Stark pinpoint the 7 most common reasons leaders fail. They also describe the 7 prescriptions for success, complete with 49 recommended actions.